Manufacturer of a wide range of products which include ss conveyor table, box handling trolley, foldable ms pallet, assembly trolley, assembly table and belt conveyor. We offer a comprehensive range of phenomenal quality SS Conveyor Table, which is mainly used in packing and inspection of materials. 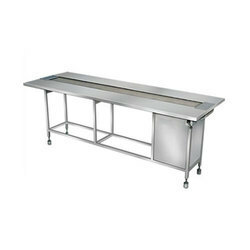 Additionally, this conveyor consists of Stainless Steel Table Top and PVC Coated Loop of Sandwich Belt at the center. Moreover, these Conveyors are made from very finest quality raw material, which ensures trouble-free work performance and longer service life of a machine. 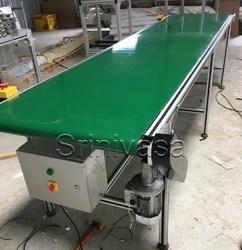 Also, these Table Conveyors are manufactured by employing technologically advanced machinery and can be custom made as per client requirement. Our company has earned the huge support of customers by ably serving to the large desires and specifications of customers. Moreover, our focus is on satisfying customers immensely, therefore, we have directed all our endeavors towards providing them a superior quality range of Box Handling Trolley. Our products are manufactured using the qualitative material, which is being sourced from the industry’s renowned and reliable vendors. The quality of the whole assortment is stringently checked on defined parameters before we supply them into the market. Ours' is a customer-focused organization, which is engaged in manufacturing and supplying superior-grade Foldable MS Pallet. We have manufactured the offered range of industrial pallets using the optimum quality raw material, which is procured from the certified vendors of the market. 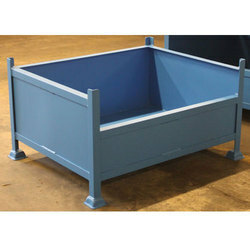 These industrial pallets are commonly used in the restaurants, hotels and storage areas. We are engaged in offering a wide range of Mild Steel Drawer Trolley to our clients. These trolleys are made up of mild steel and are highly durable in use. 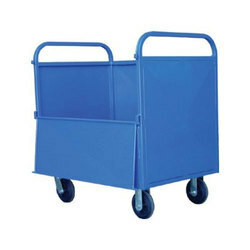 We offer these trolleys at highly reasonable rates to our clients. These trolleys are highly demanded due to their attractive features.